Patch image contributed by Michael Tricarico Jr.
Emblem image contributed by Pedro Carrasco Bravo. 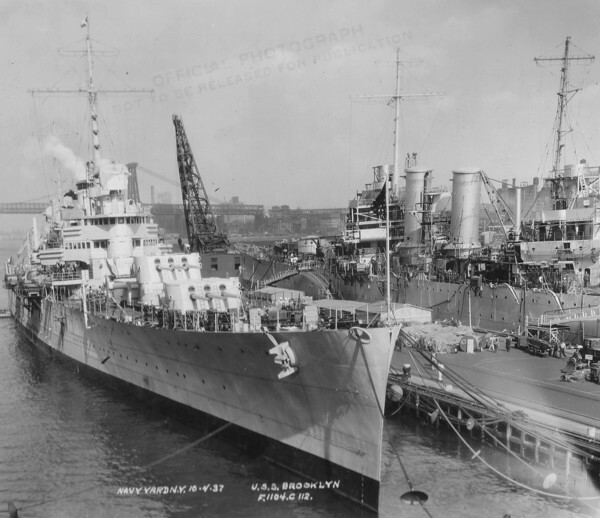 "Navy Yard N.Y., 3-8-35 - U.S.S. Brooklyn, CL.40. 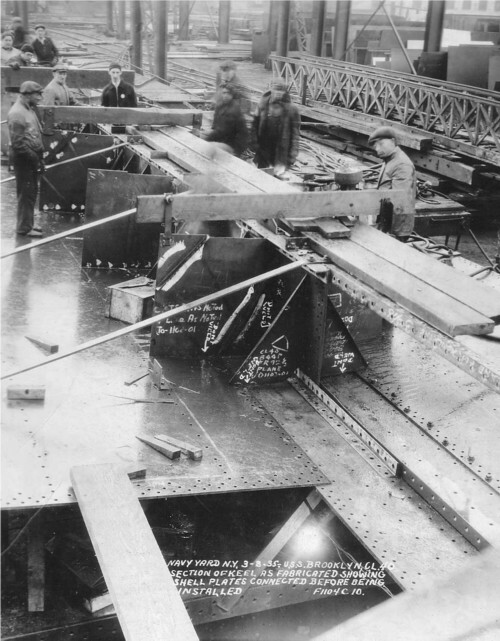 Section of keel as fabricated showing shell plates connected before being installed F1104-C-10"
"Navy Yard N.Y., 3-8-35 - U.S.S. Brooklyn, CL.40. 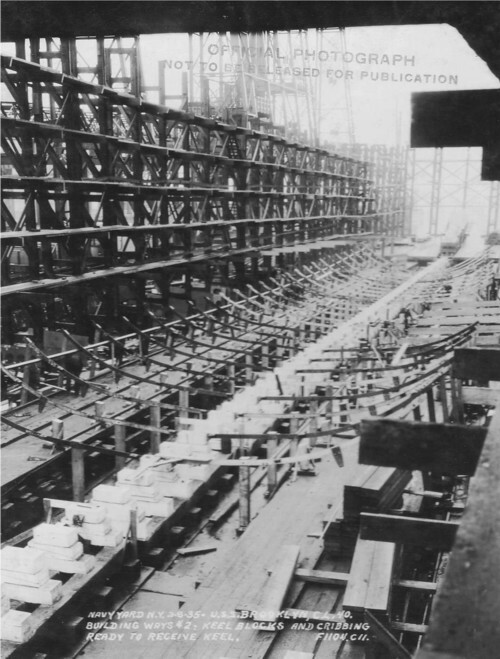 Building Ways #2: Keel blocks and cribbing ready to receive keel. 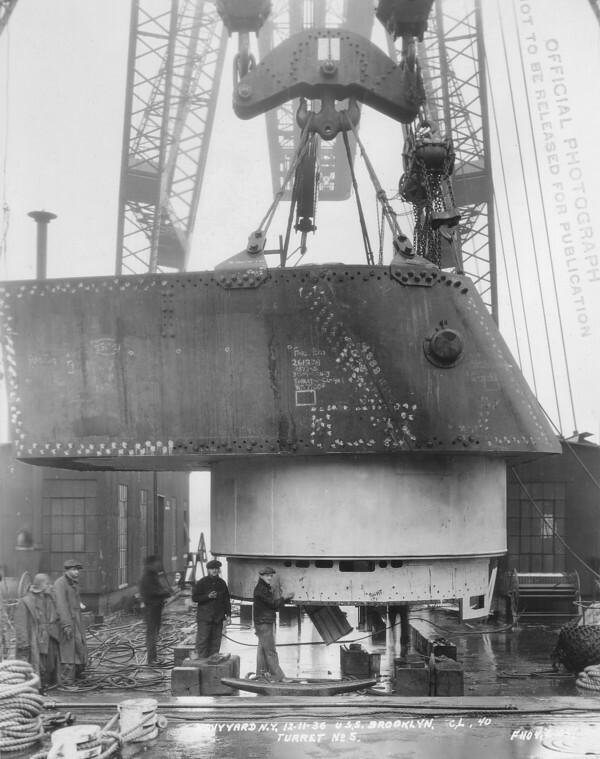 F1104-C-11"
"Navy Yard N.Y., March-12-1935 Laying keel USS. 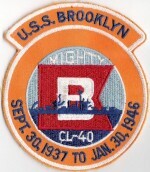 Brooklyn, CL.40, First rivet driven. 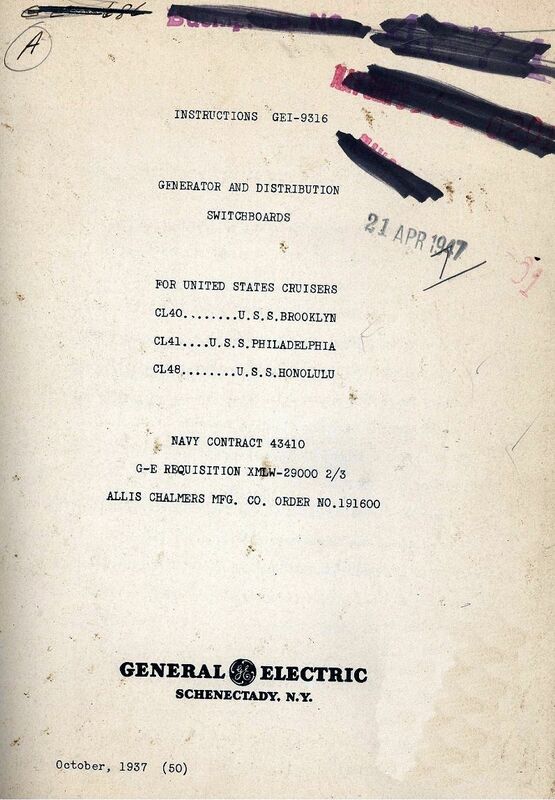 (Riveters) Raymond V. Ingersell. (Buro Pres, Brooklyn, Almetr Hoff Rep, Bklyn, Civic Council) Holder on Louis C. Wills (Rep, Bklyn COFC. Supervising. 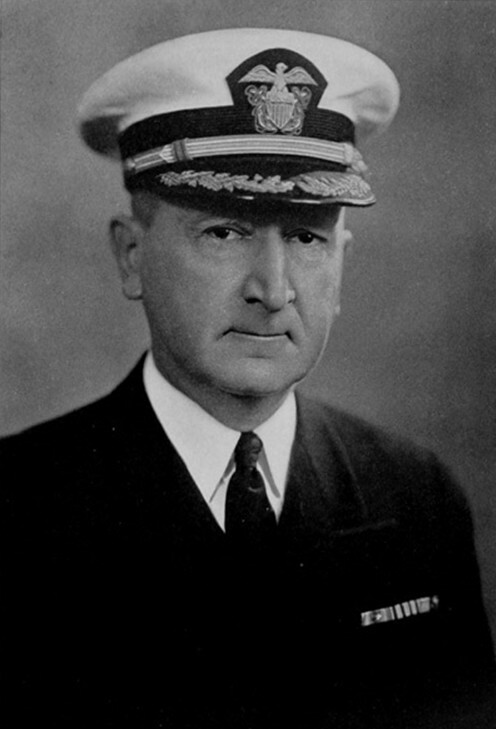 Yates Sterling Jr, Commandant G.A. Dunn Manager. F1104-C-14"
"Navy Yard N.Y., 6-25-35 - U.S.S. Brooklyn, C.L.40, View looking forward F1104-C-15." 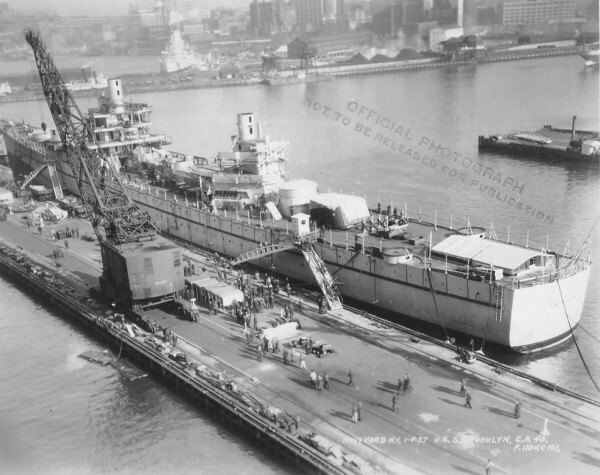 "Navy Yard N.Y., 9-27-35 U.S.S. Brooklyn, C.L.40 F1104-C-25." 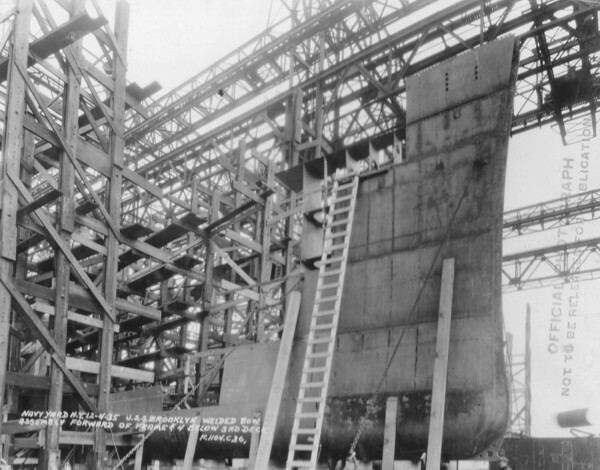 "Navy Yard N.Y. 12-4-35 U.S.S. 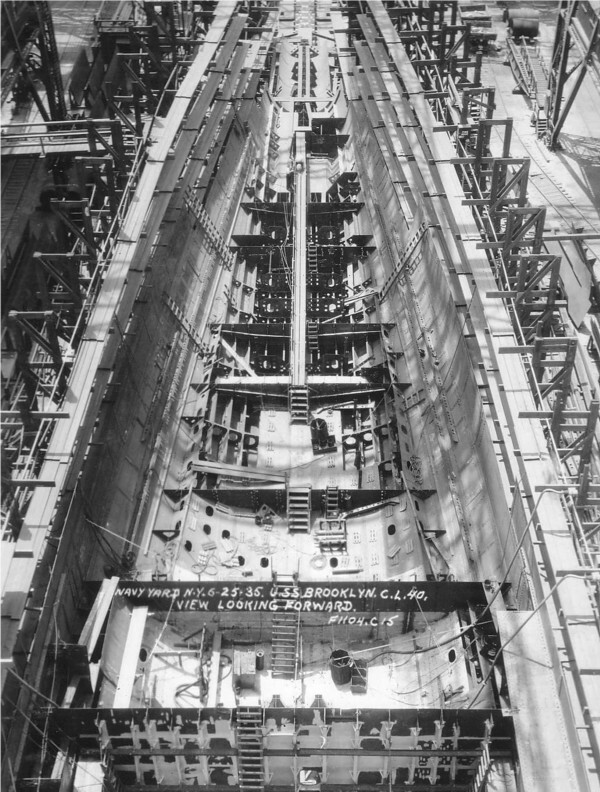 Brooklyn welded bow assembly forward of frame 4 and below 3rd deck F1104-C-36." 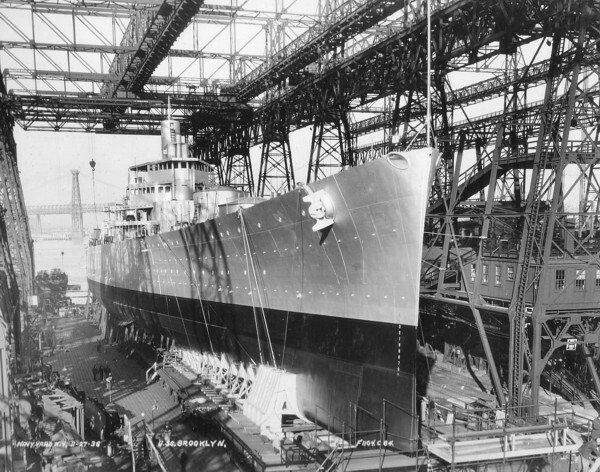 "Navy Yard N.Y. 4-10-36 U.S.S. 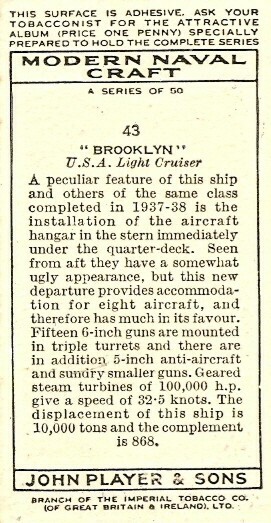 Brooklyn CL 40 midships looking forward F1104-C-53." 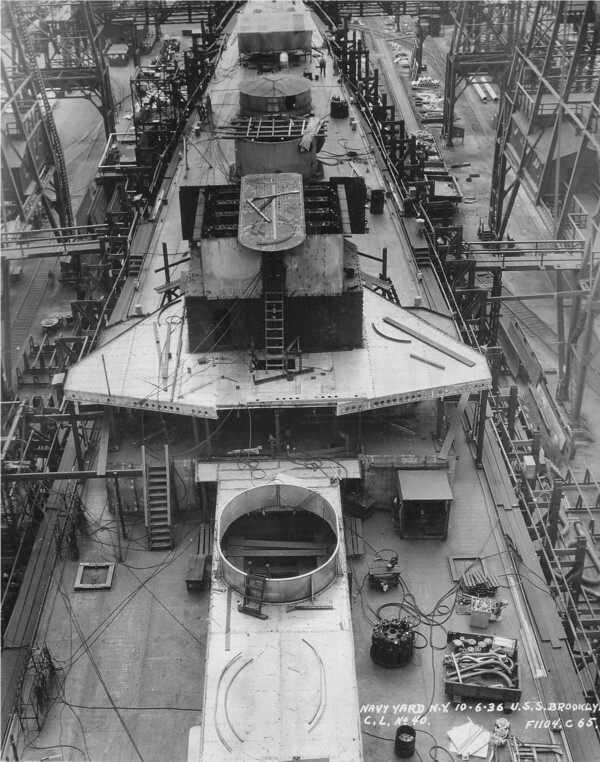 "Navy Yard N.Y. 10-6-36 U.S.S. 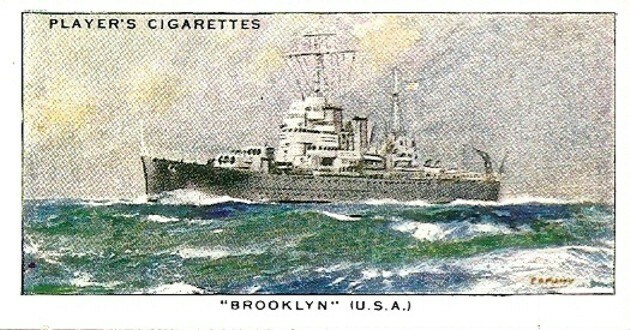 Brooklyn C.L. No 40 F1104-C-65." 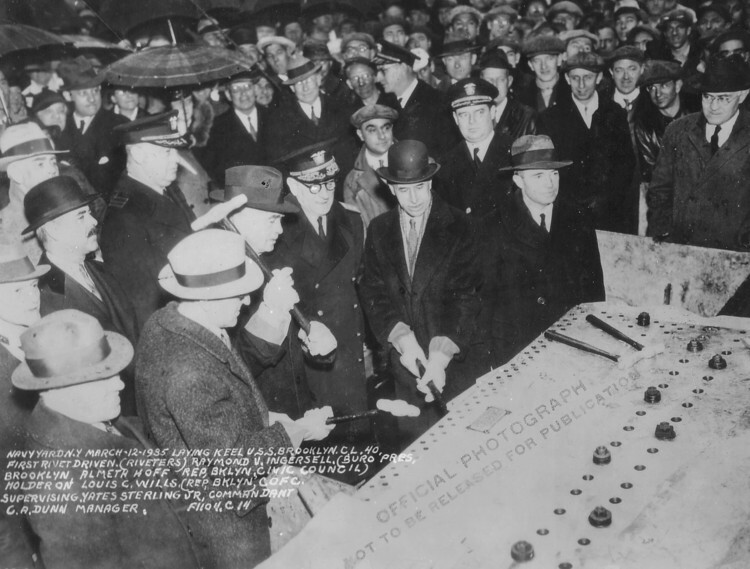 "Navy Yard N.Y. 11-27-36 U.S.S. Brooklyn, F1104-C-84." 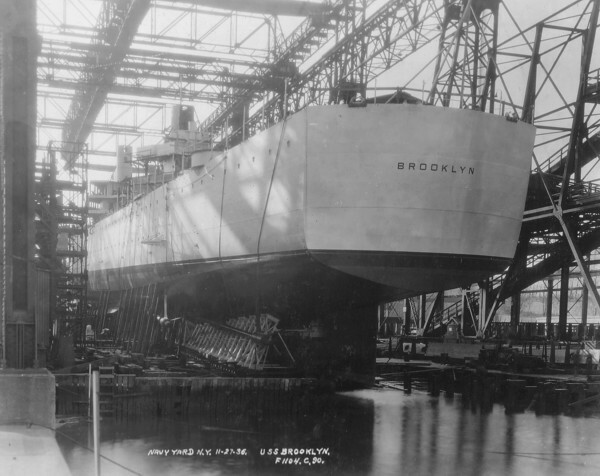 "Navy Yard N.Y. 11-27-36 U.S.S. Brooklyn, F1104-C-90." 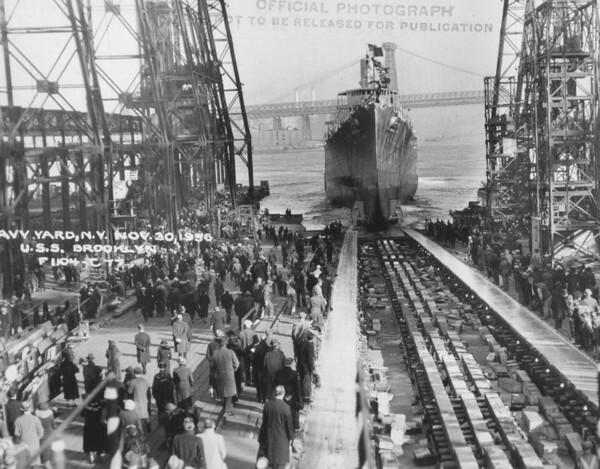 "Navy Yard N.Y. 1-4-37 U.S.S. Brooklyn C.A. 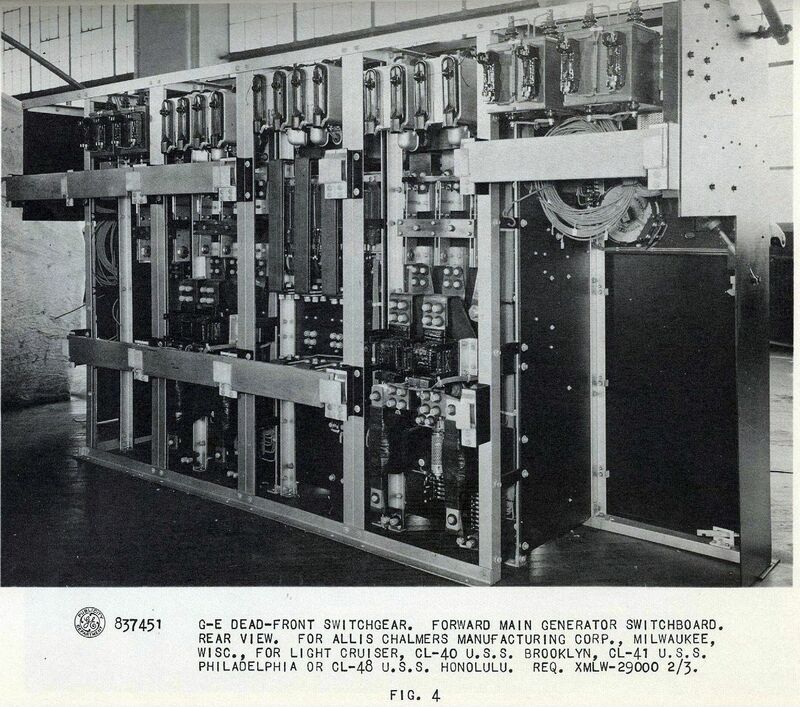 40 F1104-C-101." 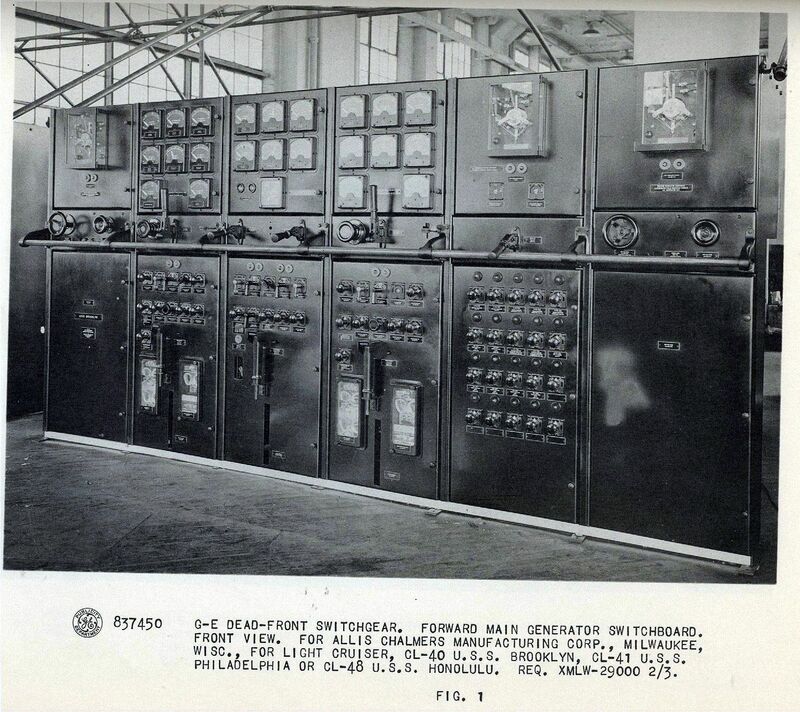 "Navy Yard N.Y. 3-30-37 U.S.S. Brooklyn C.L. 40, F1104-C-103." 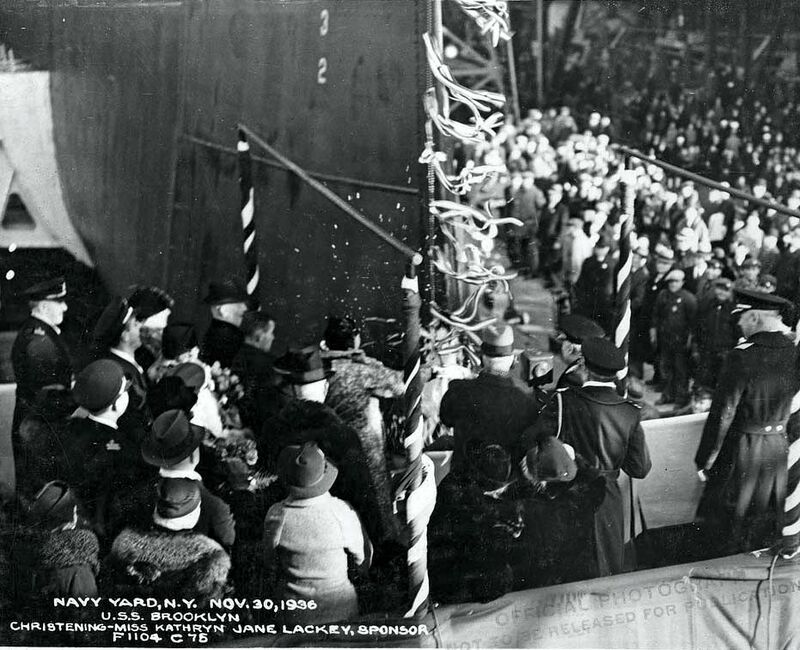 "Navy Yard N.Y. 12-11-36 U.S.S. Brooklyn C.L. 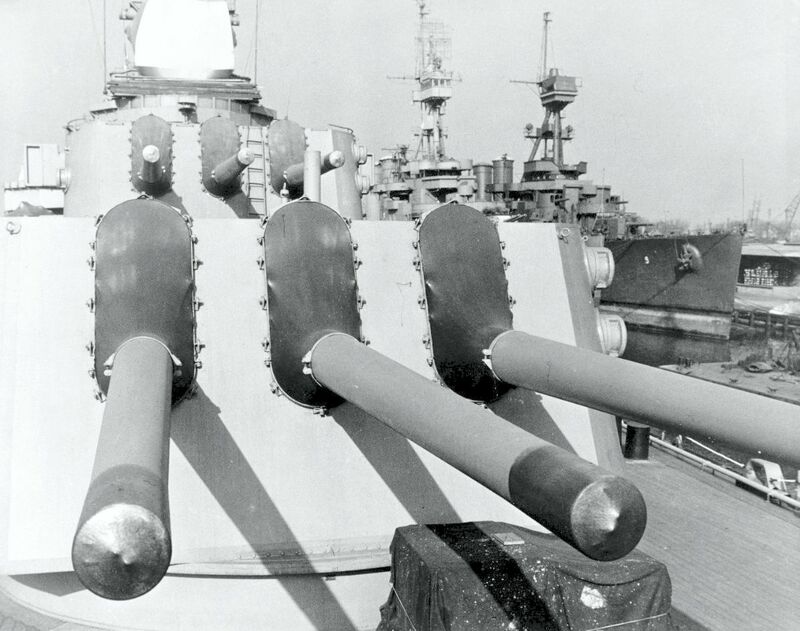 40 Turret No 5 F1104-C-104." 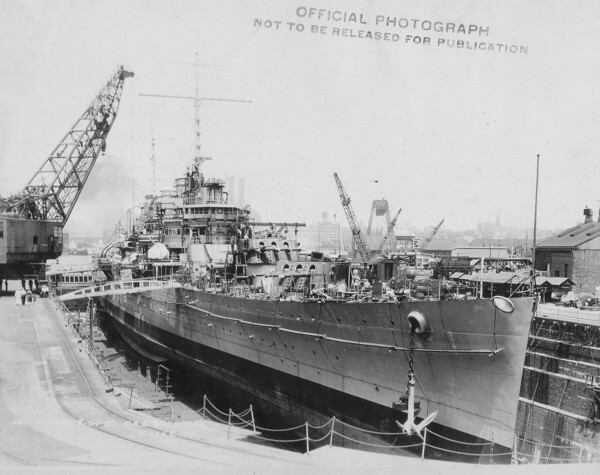 "Navy Yard N.Y. 6-24-37 U.S.S. 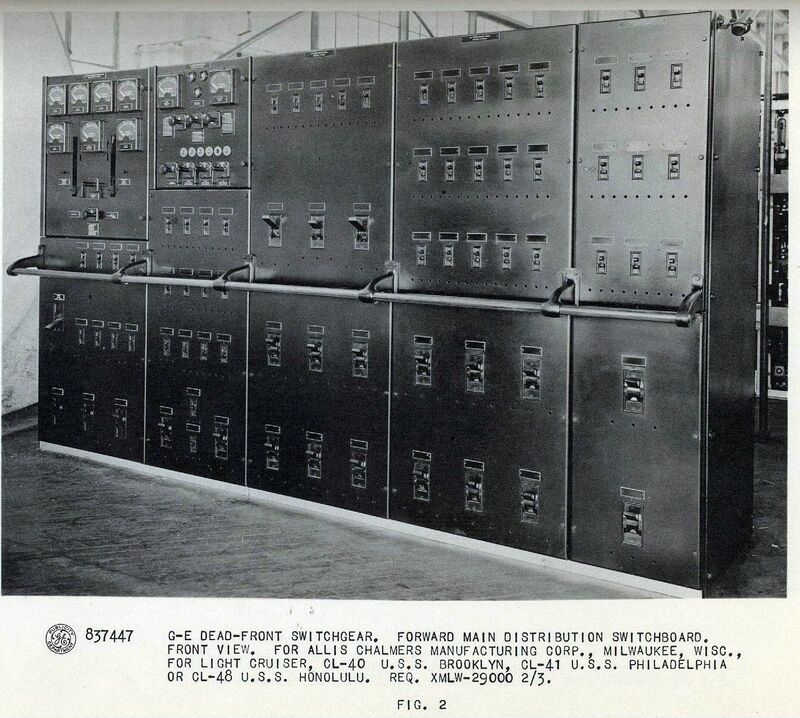 Brooklyn F1104-C-107." 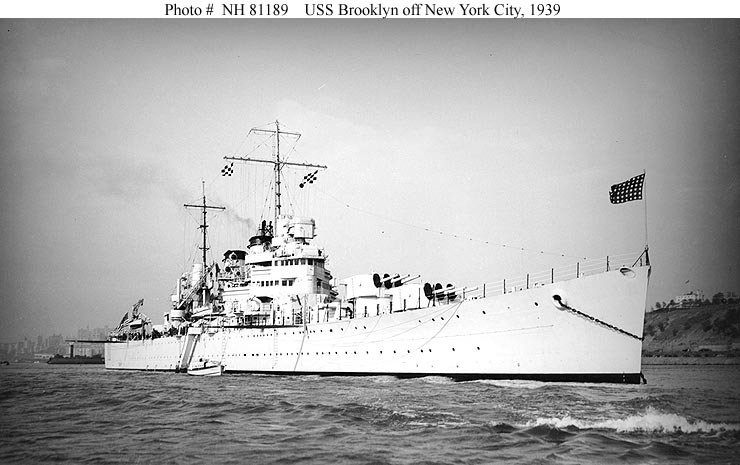 "Navy Yard N.Y. 10-4-37 U.S.S. Brooklyn F1104-C-112." 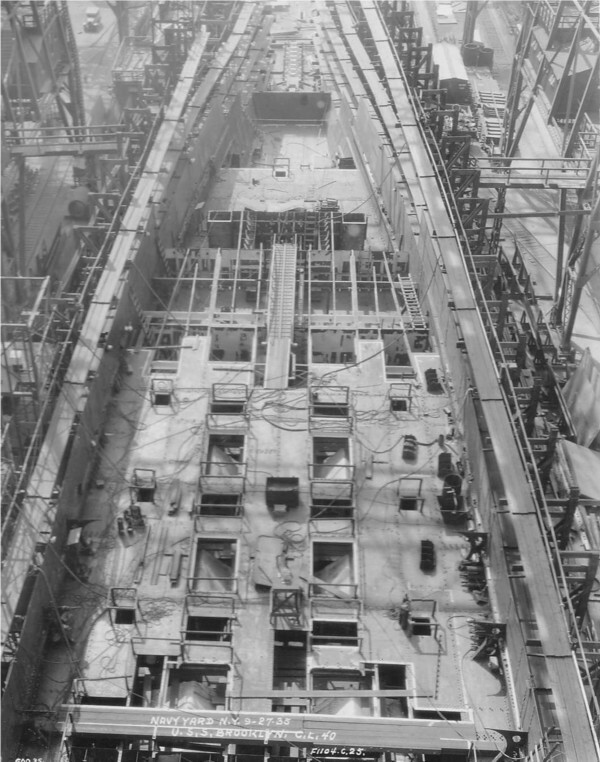 "Navy Yard N.Y. 6-14-38 U.S.S. 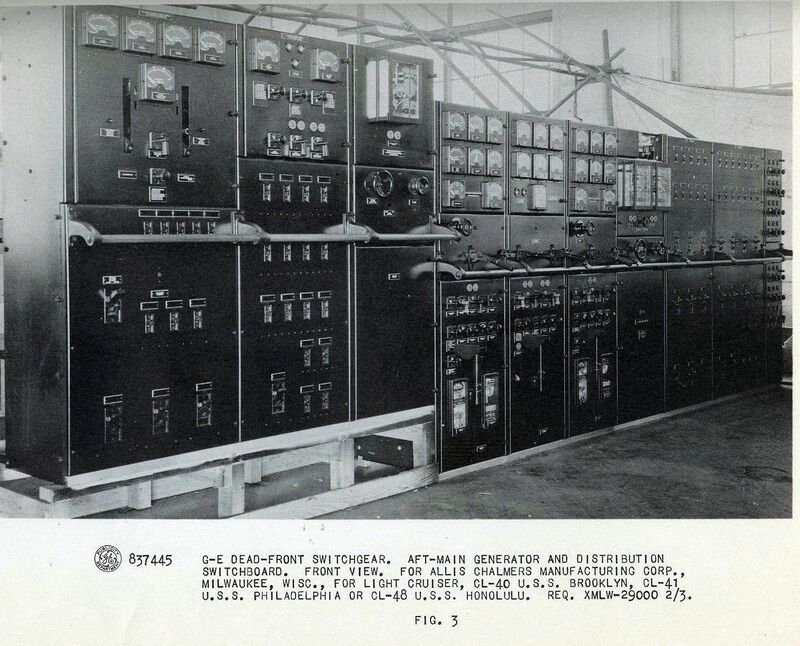 Brooklyn F1104-C-284." 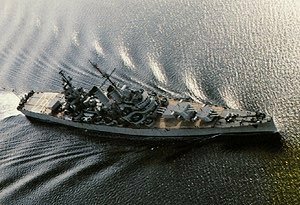 Undated aerial view of the USS Brooklyn (CL 40). 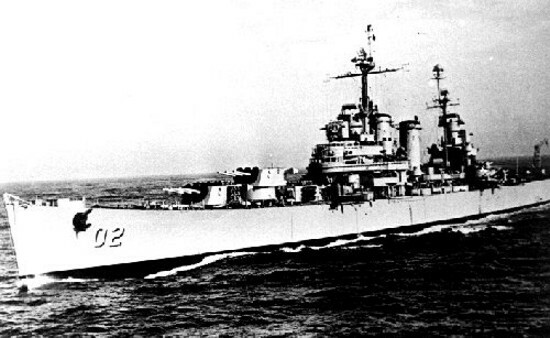 The ship is painted in Measure 22 camouflage scheme. 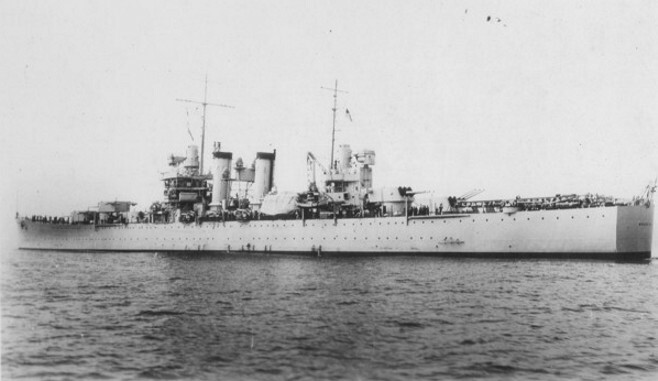 USS Brooklyn (CL 40) anchored off Portsmouth, NH in May, 1939. 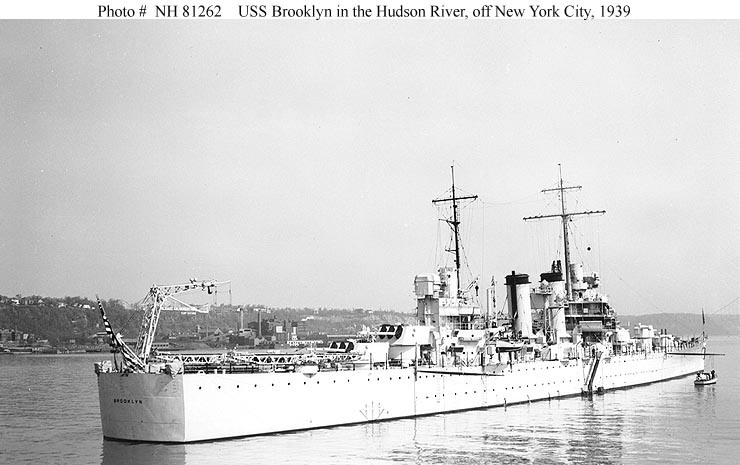 The Brooklyn was part of the USS Squalus (SS 192) salvage fleet. LIFE Magazine Archives - Carl Mydans Photographer, shared by Peter DeForest. 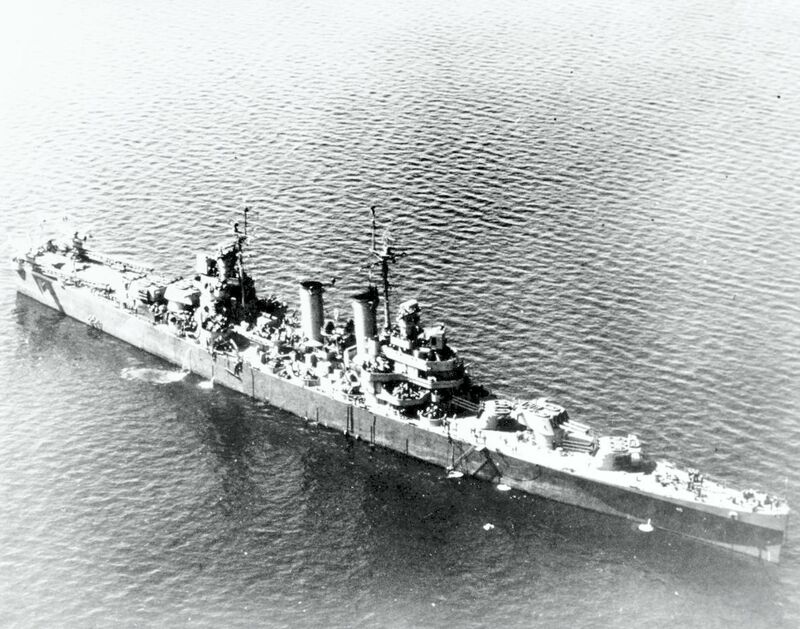 0404053 98k USS Brooklyn (CL 40) anchored off Portsmouth, NH in May, 1939. 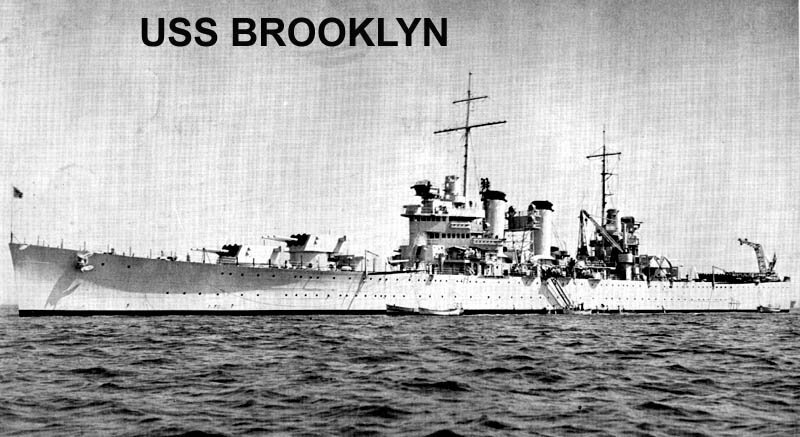 The Brooklyn was part of the USS Squalus (SS 192) salvage fleet. 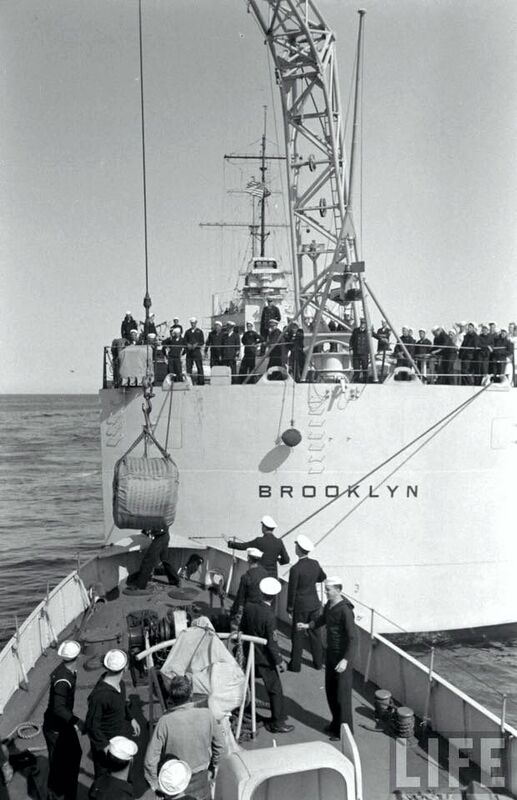 The Brooklyn is seen here using her stern aircraft crane to transfer supplies to other vessels in the salvage fleet. USS Brooklyn (CL 40) in the Hudson River, off New York City, 1939. The Palisade Amusement Park is in the center background. Official U.S. Navy Photograph, now in the collections of the National Archives - 80-G-1023215. USS Brooklyn (CL 40) Anchored in the Hudson River, off New York City, 1939. Donation of Lieutenant Gustave J. Freret, USN (Retired), 1972. U.S. Naval Historical Center Photograph - NH 81189. 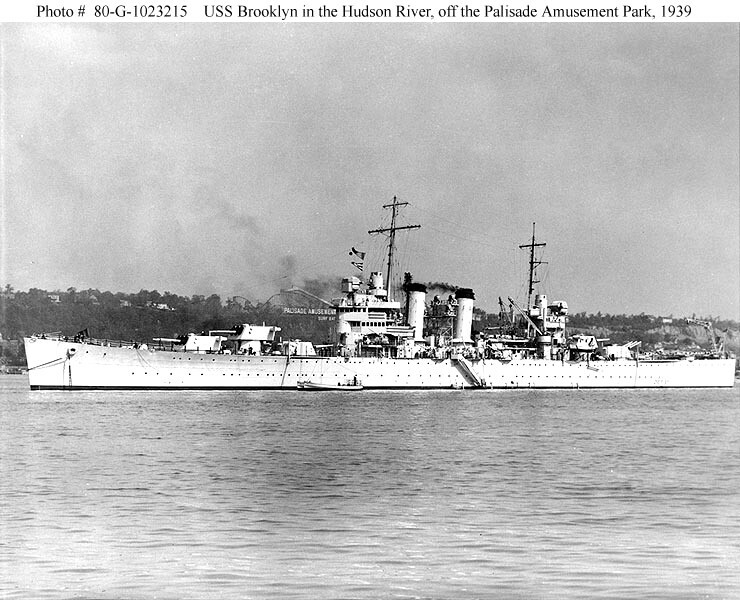 USS Brooklyn (CL 40) Anchored in the Hudson River, off New York City, 1939. The Palisade Amusement Park is in the left background, beyond Brooklyn's aircraft crane. Donation of Lieutenant Gustave J. Freret, USN (Retired), 1972. U.S. Naval Historical Center Photograph - NH 81262. 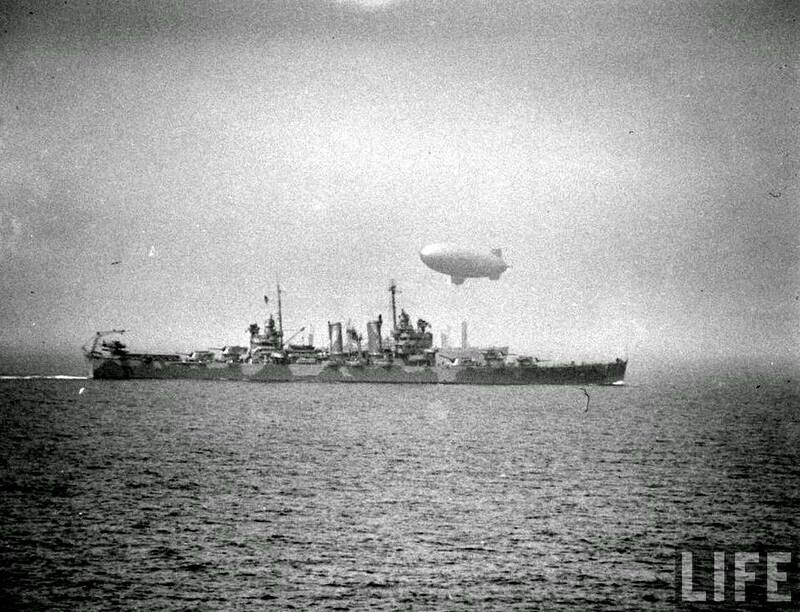 USS Brooklyn (CL 40) in an Atlantic Convoy in Early-Mid 1942, as seen from either the USS New York or USS Texas. LIFE Magazine Archives - Frank Scherschel Photographer, shared by Peter DeForest. 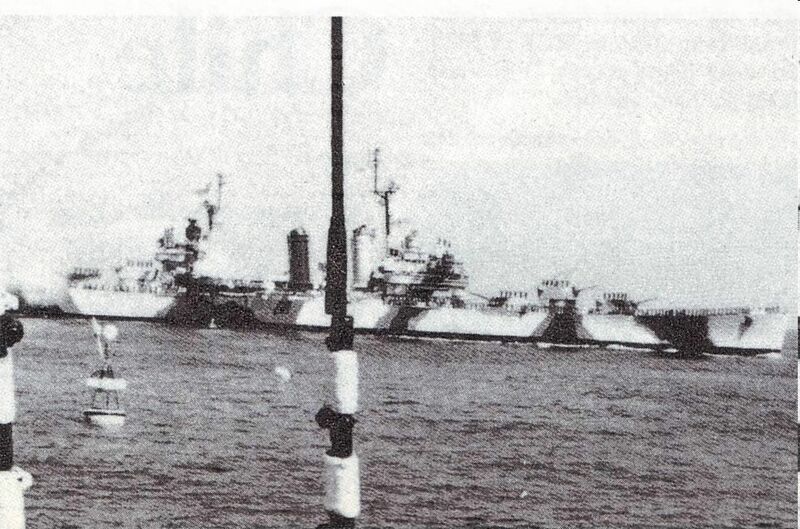 USS Brooklyn (CL 40) and USS Suwannee (ACV 27) underway, with the amphibious convoy, en route to North Africa, early November 1942. 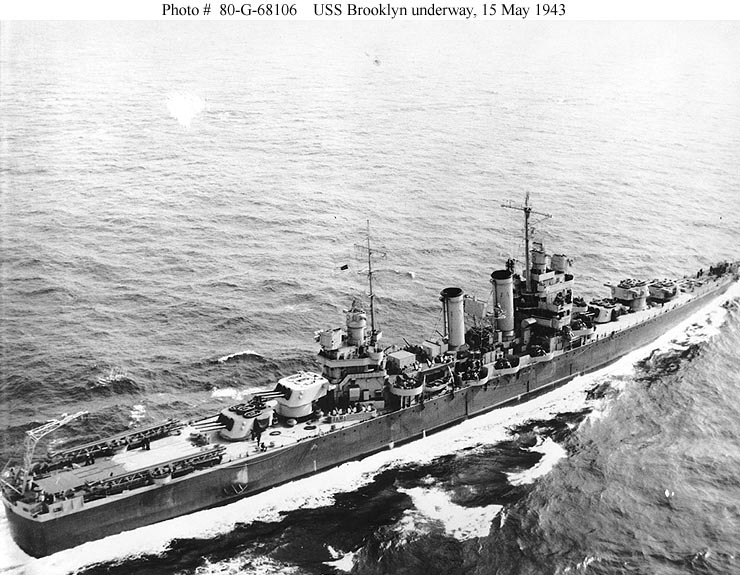 USS Brooklyn (CL 40) Underway at sea, 15 May 1943. Photographed from an aircraft based as Naval Air Station Weeksville, North Carolina. 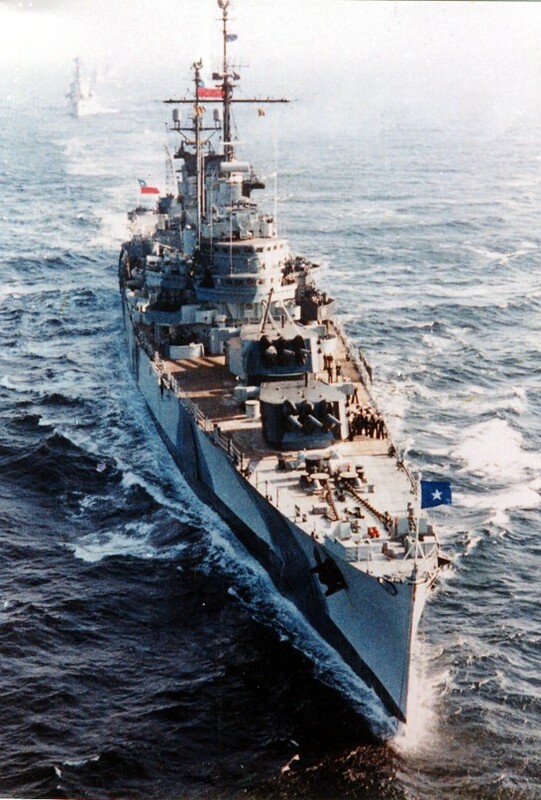 Official U.S. Navy Photograph, now in the collections of the National Archives - 80-G-68106. 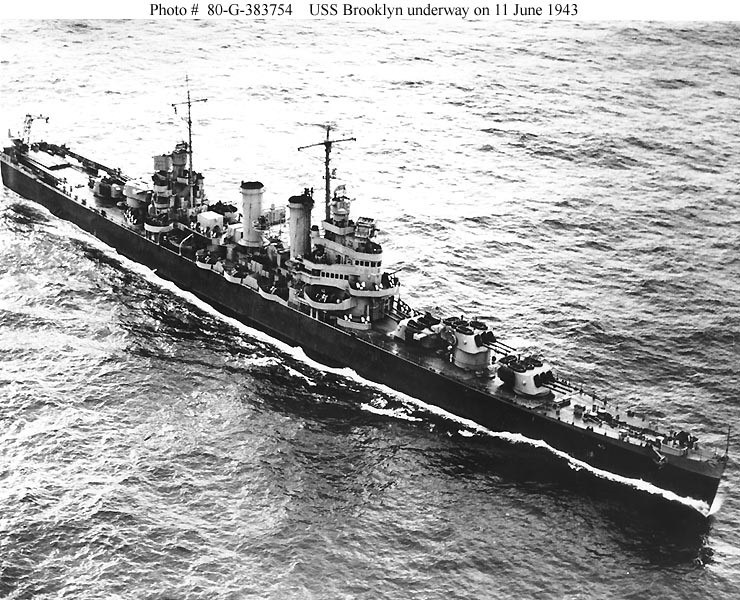 USS Brooklyn (CL 40) Underway on 11 June 1943. Photographed by Fleet Air Wing Nine. 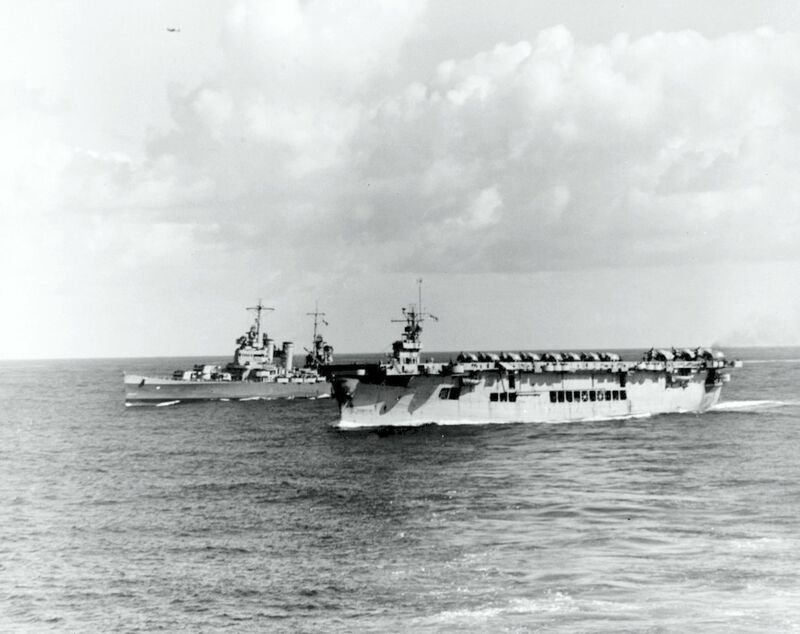 Official U.S. Navy Photograph, now in the collections of the National Archives - 80-G-383754. 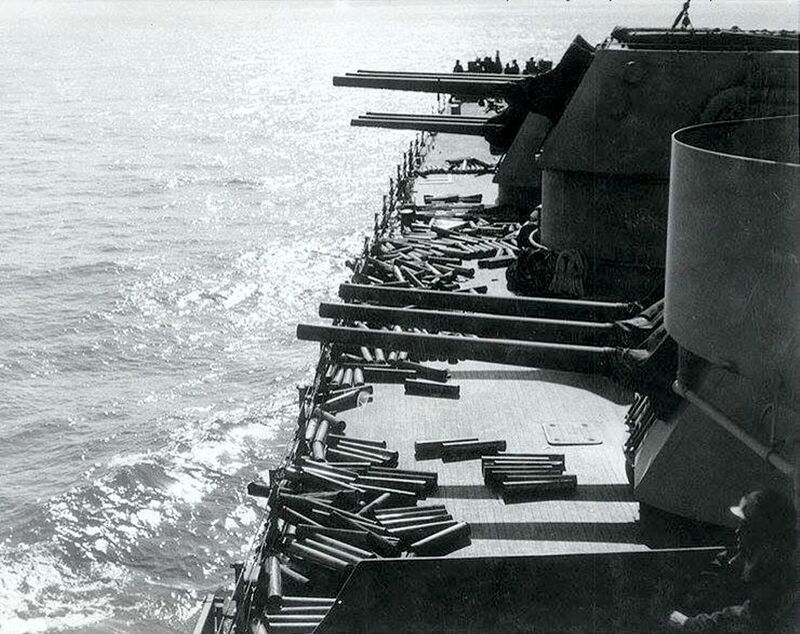 Invasion of Sicily, July 1943 - Empty shell cases litter the deck near the forward 6"/47 gun turrets of USS Brooklyn (CL 40), after she had bombarded Licata, Sicily, during the early hours of the invasion, 10 July 1943. Official U.S. Navy Photograph, now in the collections of the National Archives - 80-G-42522. 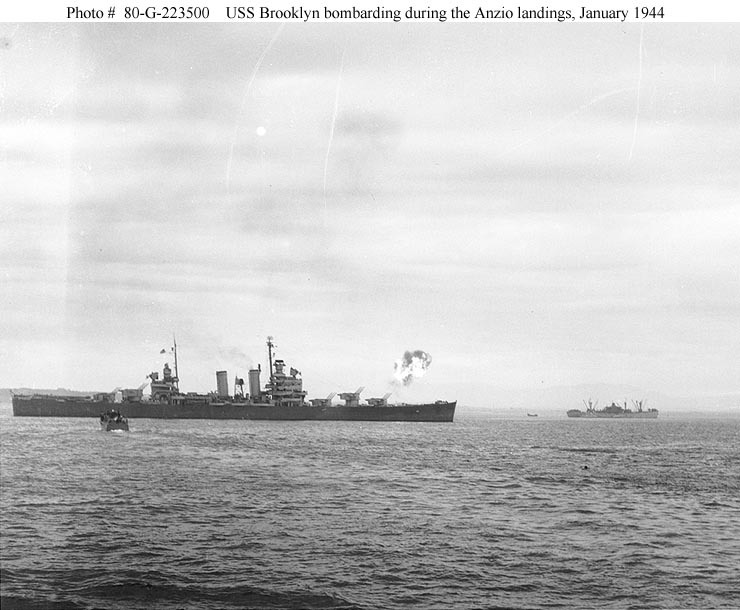 Anzio Campaign, 1944 - USS Brooklyn (CL 40) bombarding with her 6"/47 guns, during the landings at Anzio, Italy, 22 January 1944. Photographed from USS Frederick C. Davis (DE 136). 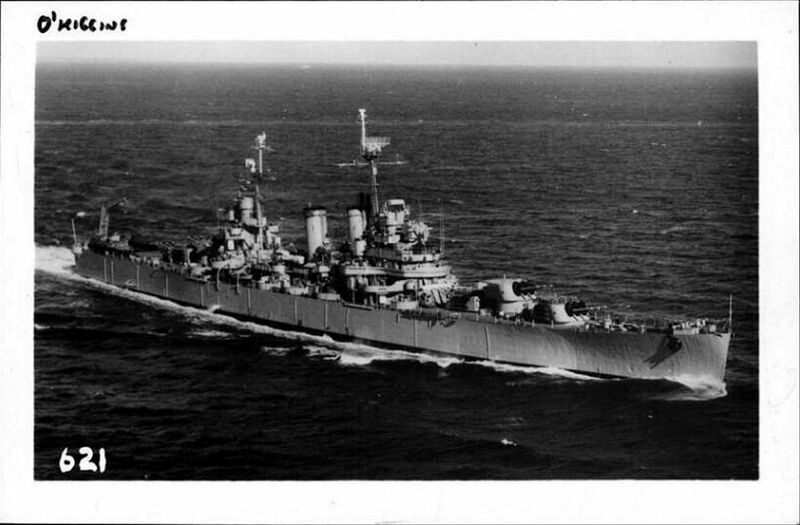 Official U.S. Navy Photograph, now in the collections of the National Archives - 80-G-223500. 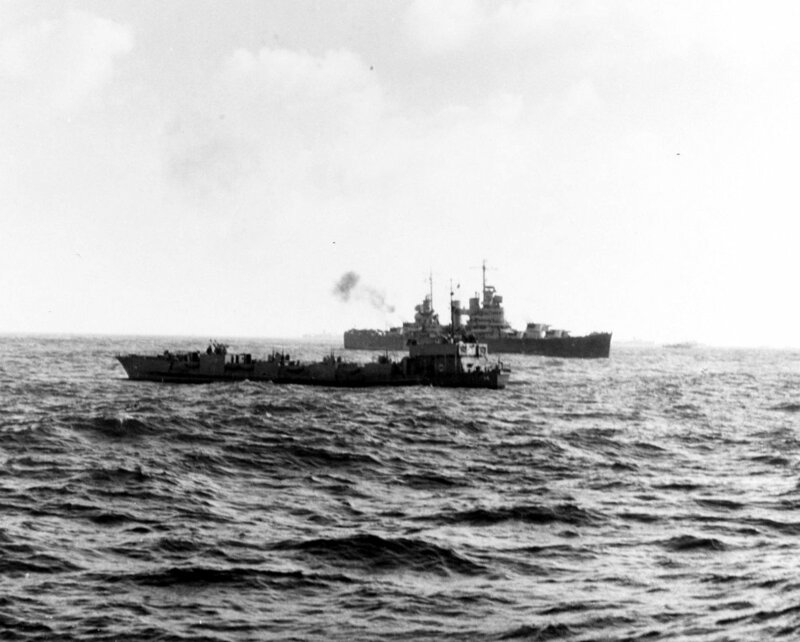 HM LCF(3)-14 is in the foreground as USS Brooklyn (CL 40) bombarding during the initial landing at Anzio, 22 January 1944. 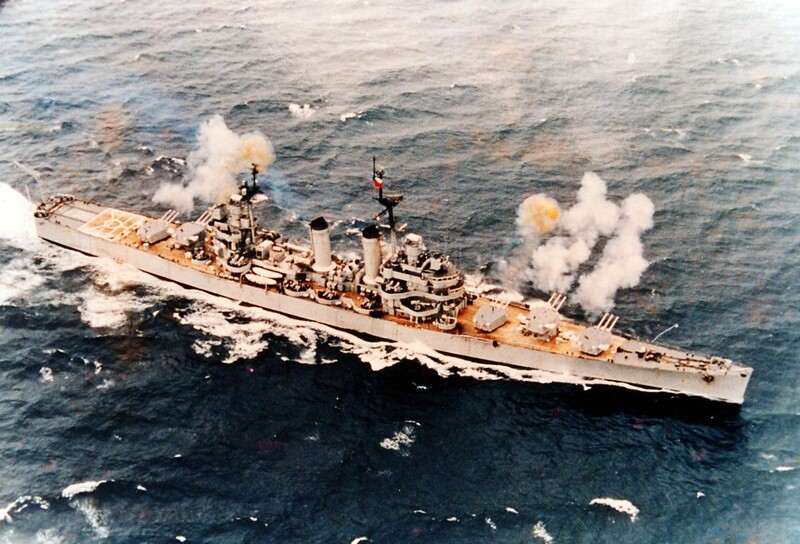 Photographed from USS Frederick C. Davis (DE 136). 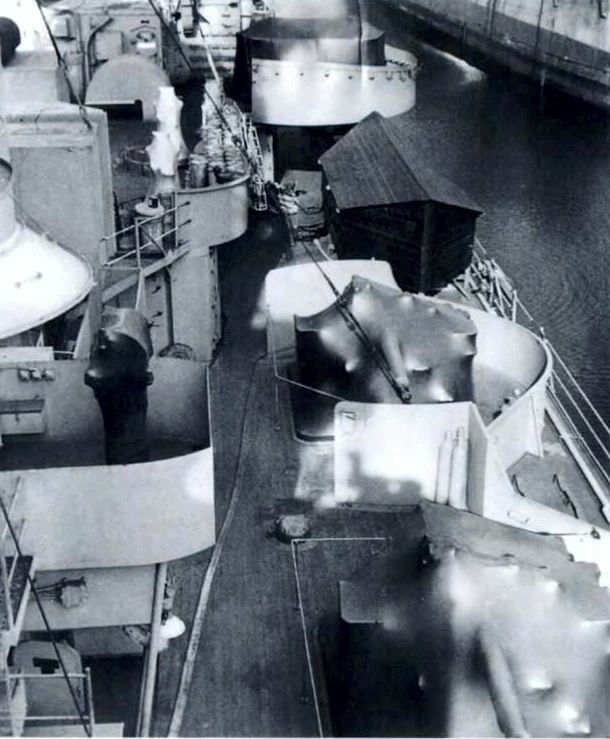 This photo shows some of the Mk11 5" guns on the mothballed USS Brooklyn (CL 40), along with various AA gun directors and other deck items which have been covered by way of a blown plastic process to protect the equipment. 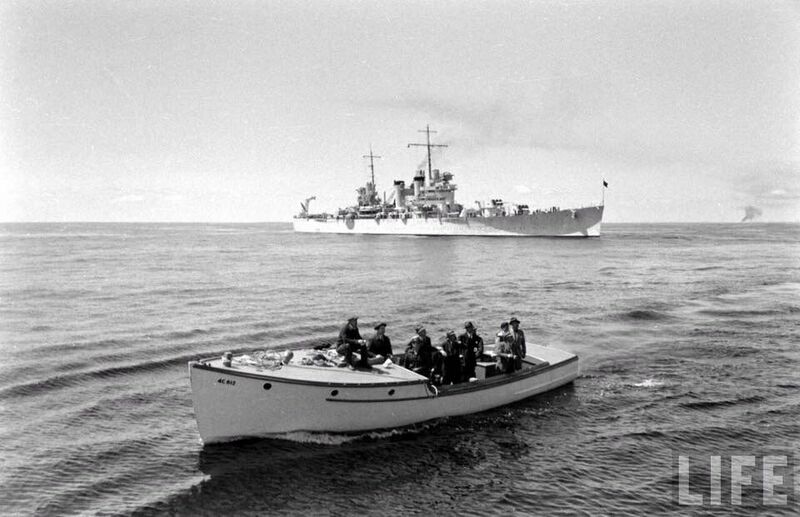 Also of interest, unrelated to the plastic process, is USS Brooklyn's wooden seaboat. After WWI, smallboats on the “Red Lead Row” ships were just covered in canvas. This sagged after a while, pooling up rainwater which eventually leaked through damaging the boat. After WWII, smallboats on inactivating ships were painted, topped with tarpaper, then covered with a steepled roof to run off rainwater. 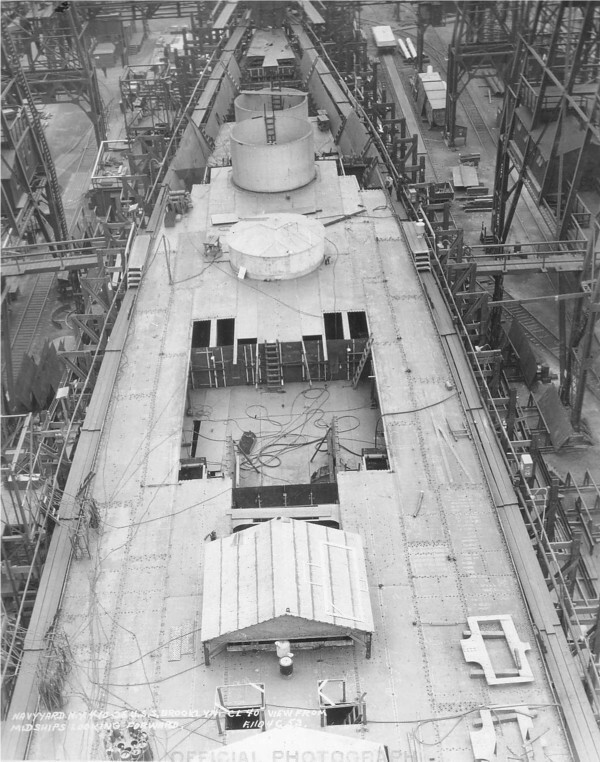 View on the USS Brooklyn's (CL 40) forecastle, looking aft, showing seals over her 6"/47 guns and other equipment to sustain dehumidification while she is in "mothballs." 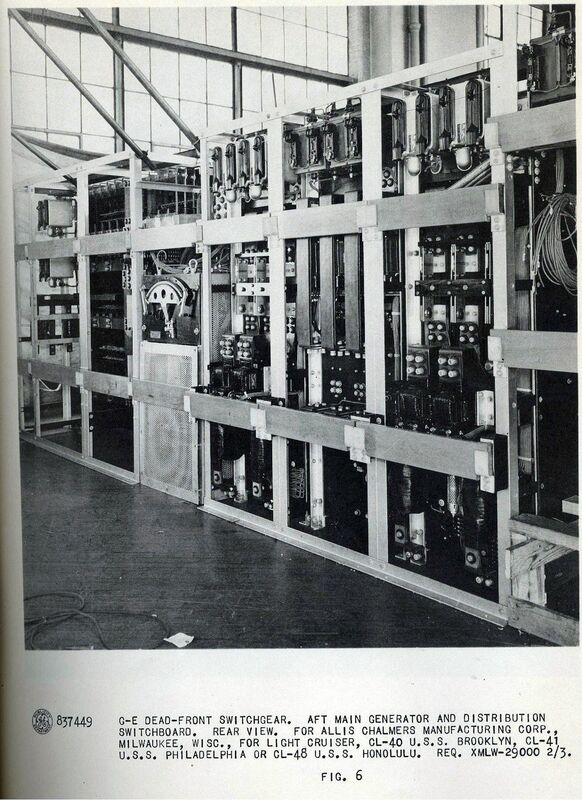 Photographed at the Philadelphia Navy Yard, circa early 1947. 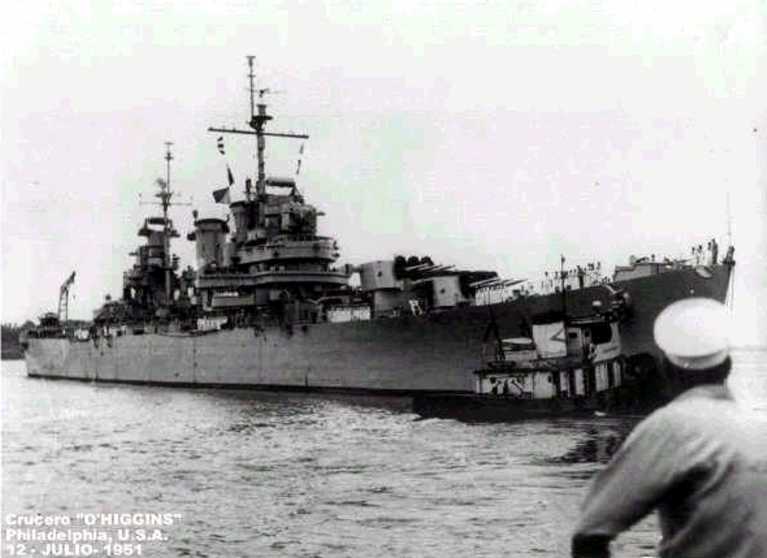 In the right background are USS Richmond (CL 9) and another stricken Omaha class cruiser. 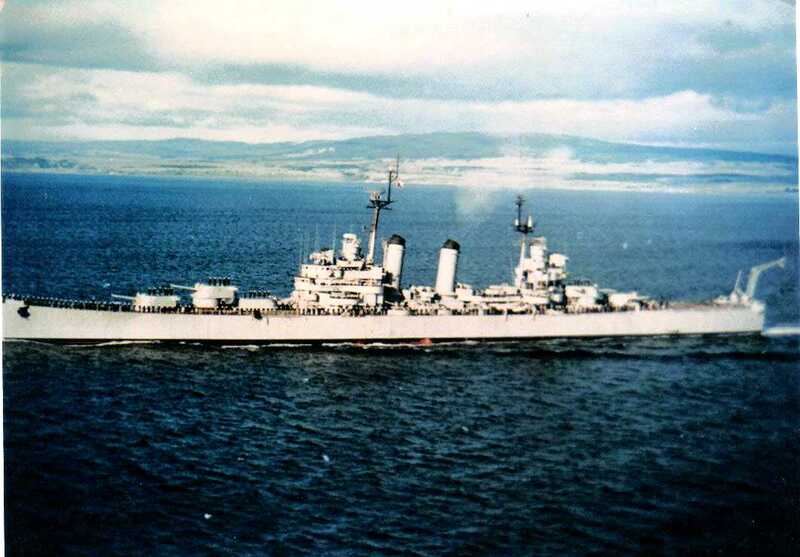 0404035 33k Starboard bow view of ex USS Brooklyn at the Philadelphia Navy Yard before commissioning in Chilean Navy, 12 July 1951. 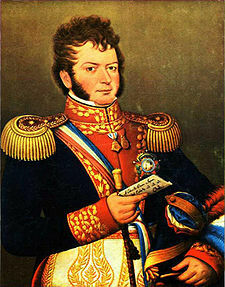 Pedro Carrasco Bravo. 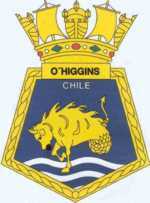 Chilean light cruiser O'Higgins (02) underway. 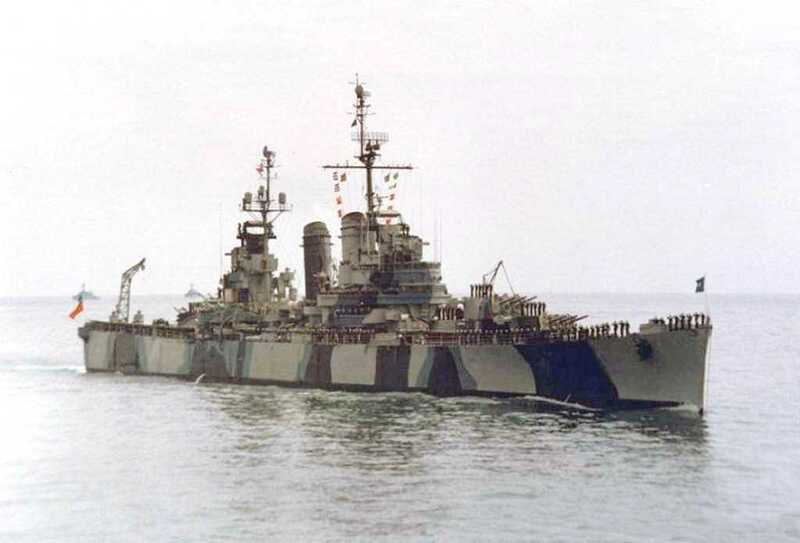 Note her camouflage paint scheme.